Self-Adhesive Letters are removable, repositionable and reusable. No punching out of letters, no staples, no pins and no tape required. Easy to use. Just peel and place. Self-Adhesive Letters adhere to any clean and dry surface that is smooth or slightly textured (even wood and painted brick wall). Fade-resistant, acid-free. Unique adhesive leaves no residue and never becomes permanent. 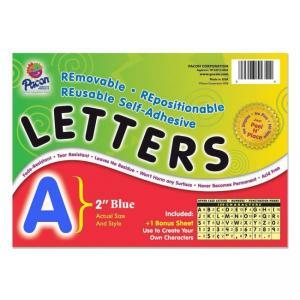 Each package contains upper case letters along with numbers and punctuation marks. Set of 2" letters include 159 characters. Ideal for bulletin boards, signs, posters, presentation boards and much more.